The iPhone 3G is now about two years old, and it's nearing the end of its lifecycle. The proof? 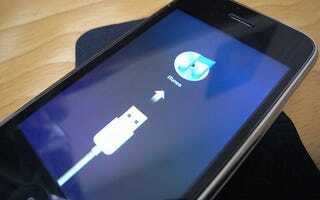 Installing the latest iOS4 on it causes it to slow to a crawl, and that's with half of its features missing. Judging on the performance of both my and Mark Wilson's 3Gs as well as based on anecdotal evidence on Twitter and support forums, the new iOS4 update is wreaking havoc on older iPhone 3Gs. With my phone, typing has become nearly impossible. One of the first letters I hit pops up, but then stays stuck as I continue to type. It catches up eventually, but without the visual cues that I'm hitting the right keys, it makes typos an inevitability. Furthermore, opening very basic apps has gotten much slower, and apps crashing to the home screen is much more frequent. Merely trying to open the settings panel took me three tries right after installation, for example. Loading up my photo library takes upwards of 10 seconds. Updating Instapaper takes twice as long as it used to. There's a new pause when I hit the home button from within an app, and when it finally does close, the animation of app icons falling back into place is jittery and stilted. And what's really to gain by updating? 3G owners aren't getting multitasking, they aren't getting wallpapers, they aren't getting Bluetooth keyboard support. You're essentially just getting app folders and threaded emails. Other than that, there's nothing new. I went from having a slightly sluggish yet functional phone yesterday to an "updated" phone today that can barely handle the most basic of tasks, all with very little new functionality to show for it. But hey, at least it'll be ready for iAds in a couple weeks! At this point, a good number of 3G owners are probably planning to upgrade to an iPhone 4 in a couple of days. And really, with the specs this phone has, it's not shocking that it can't handle the newest OS. But if it runs this poorly, and with major features removed, you've got to wonder why it was made available for the 3G at all.